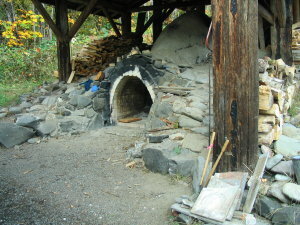 We fired Jay Widmer’s Digger Mountain Anagama near Alsea, Oregon during October 24th – 26th and opened and unloaded the kiln on October 31st. 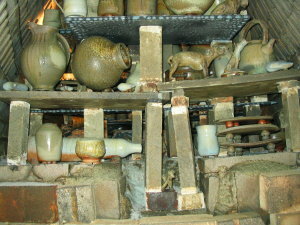 Below are pictures of the different ranges in the kiln as we unloaded them and other pictures of the firing. I will probably add more as pictures become available. 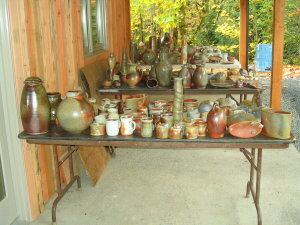 I will certainly add pictures of some of the pots when I get around to getting them taken. 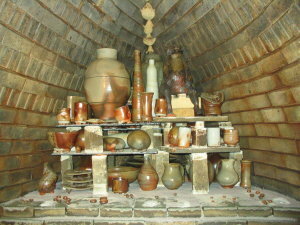 As you can see the weather was nearly perfect for firing. 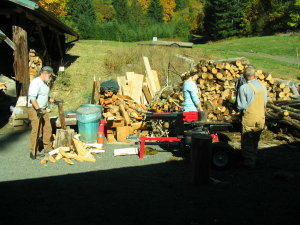 Here we are getting the wood split for both the front-stoking and side-stoking. 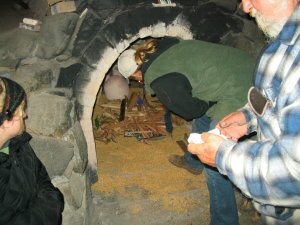 This firing we emphasized adding more wood to the side-stoke. 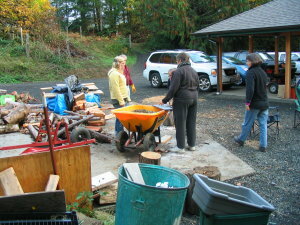 We also used more maple and wet alder than in previous firings. 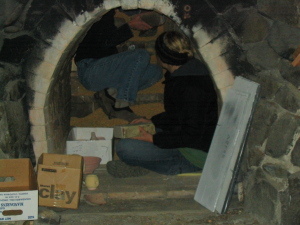 Lauren and Sandy (inside the kiln) are helping to load pots into the kiln. Lynda lights the fire as Hank and Lauren look on. 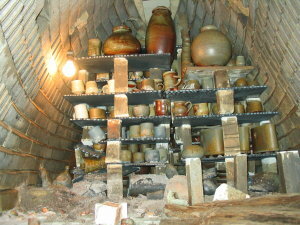 Right after lighting the kiln the batteries ran out on my camera so I don’t have pictures of stoking the kiln. After a 48 hour firing and a week of cooling we get a chance to see the results. this is the front range just beyond the fire box. There is a lot of ash deposited on the pots in the front but you can a fair amount of color in the pots a little further back. 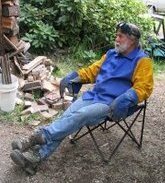 As we proceeded further back towards the side-stoke alley through ranges 2 and 3 we see more and more color and less ash deposited on the front side of the pieces. Range 4 on the back side of the stoke alley had some damaged shelves from the side-stoke wood hitting the nitrite-bonded silicon carbide shelves. 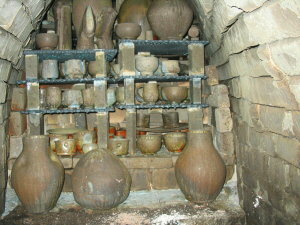 This resulted in several damaged shelves and damaged pots. 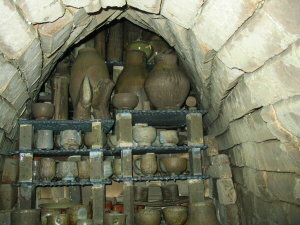 Ranges 5 and 6 have often been quieter zones of the kiln but this firing this section had much more action. 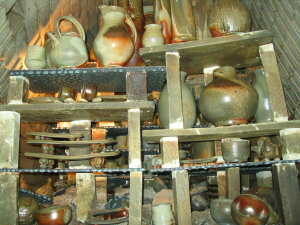 The very back of the kiln had wonderful color and ash. 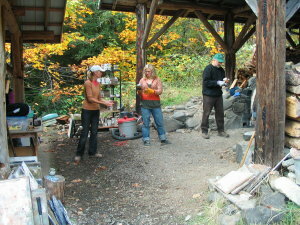 Lynda, Lauren and Joe form the “reception line” to look at each pot as it comes out of the kiln. 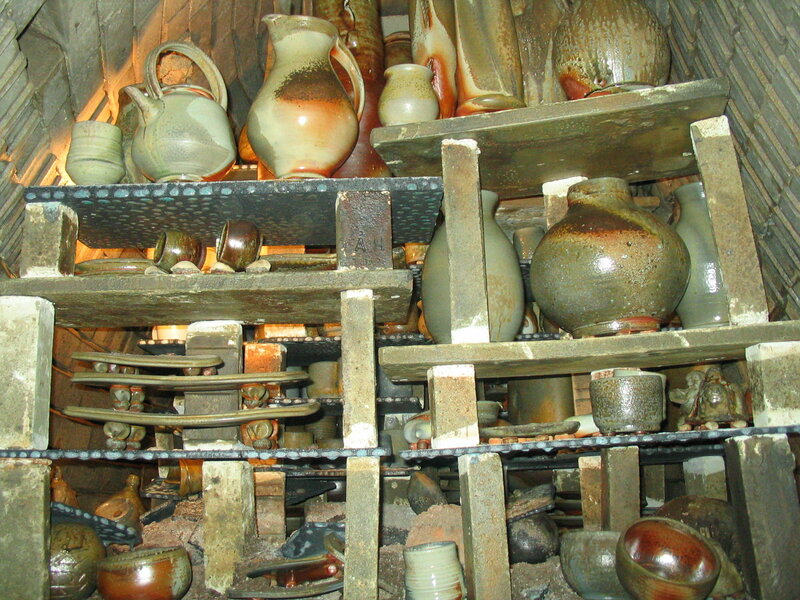 We pass each pot down the line and stack them on tables that generally contain pots from the same range of shelves. 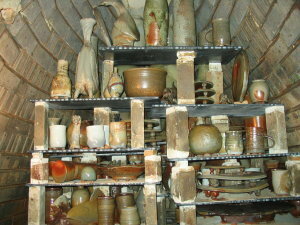 This way after the unloading we look at the pieces from each range of shelves to learn what is happening in each zone of the kiln. The information we glean from this will inform our decisions in the next firing. 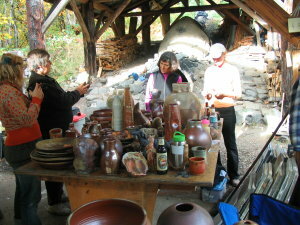 Lauren, Pat, Martha and Lynda check out the pieces from the back of the kiln. 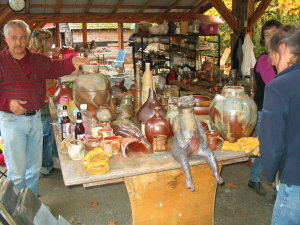 Jeff, Lauren, Martha and Sandy look at the pieces from the bakc of the kiln. Sandy is checking out Deb’s badger. 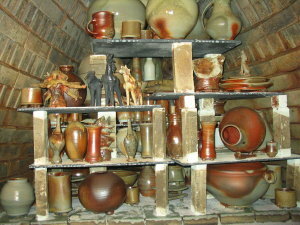 More pots from the firing. Pieces in the photo below were behind the stoke alley. 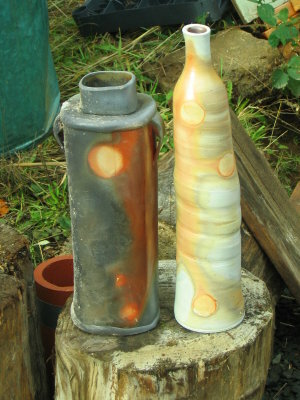 Sandy’s and Lauren’s vases show the extent of the color in this firing. Cleaning up the shelves after the unloading.